Things are finally back to normal after the extended cold snap in December and Early January. 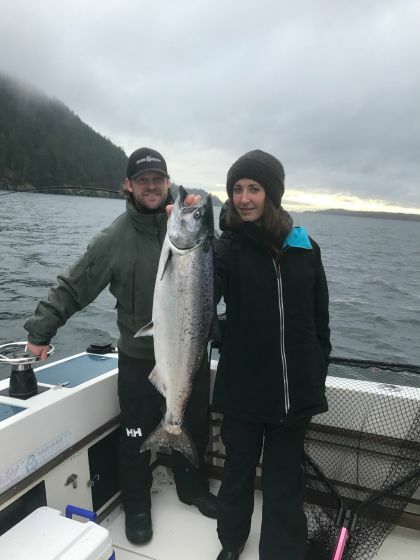 We have been on the water a lot over the last couple weeks and we have enjoyed some pretty solid winter chinook fishing! 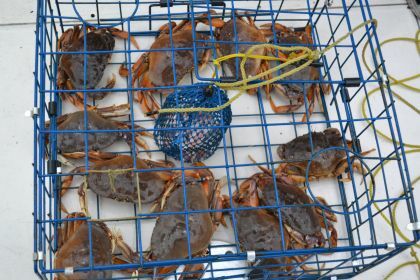 We have been fishing all over the place in recent weeks. 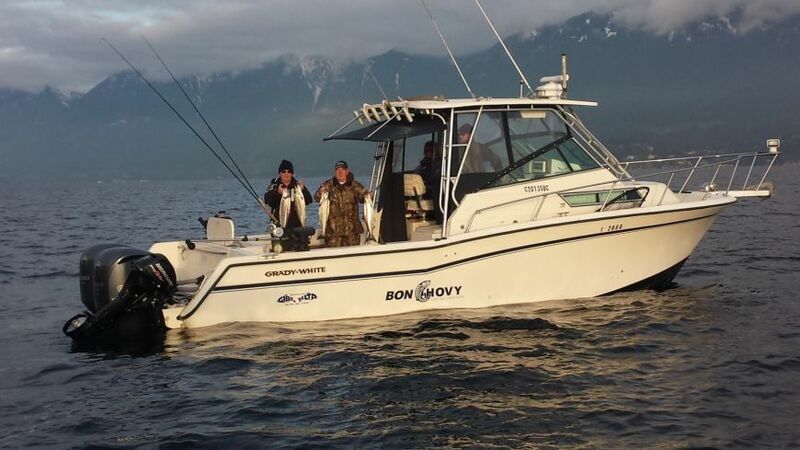 Howe Sound, Vancouver Harbour, and the Gulf Island's have all kicked out some good numbers of fish depending on the day and the weather. 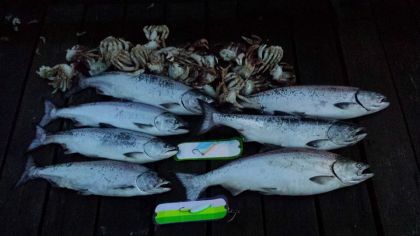 It seems to be one of those winters where you can pick one of the many winter chinook spots and be successful if you fish the area properly. 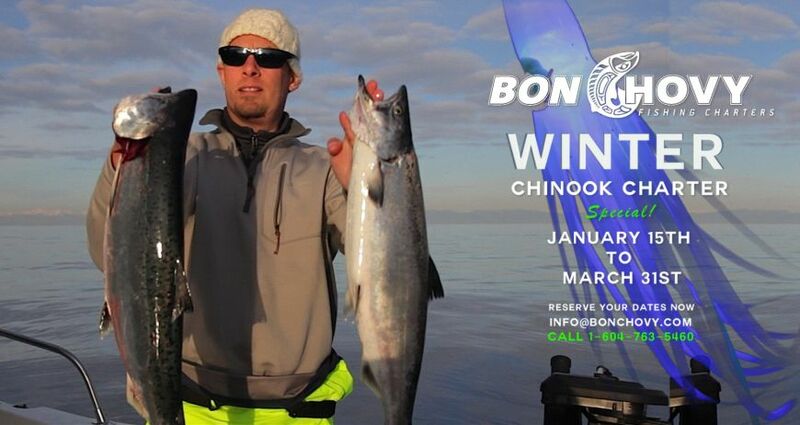 As per usual in the winter months, keeping your gear close to bottom is key to winter chinook success. These chrome fish typically hold and feed on sandy flats that are 80 to 200 feet in depth. 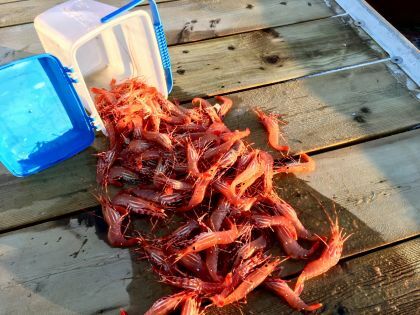 Keep a close eye on your sounder for bait and fish. We have been running primarily spoons over the last couple weeks, but we have also had some pretty good success on hootchies. Running bait will also work, but why bother with bait when spoons and hootchies are work just as good, if not better in the winter! The Outfitter Skinny G has really started to catch fire again. Some other spoons that have been working have been the G Force Trailhead, No Bananas, Bon Chovy and Flamin Hans. The Silver Horde Homeland Security and Irish Cream have also been working well. Productive hootchies have been the standard Yamashita Hootchies in Glow and White. 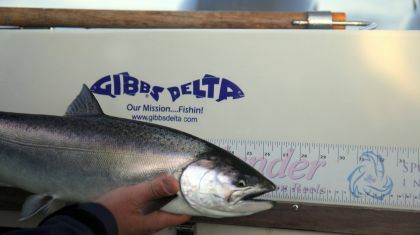 As per usual we have been running our favourite Gibbs Delta Guide Series Flashers. Our winter favourites are the STS, Lemon Lime, Bon Chovy, and Madi Flashers. If you are looking for the right gear for local waters, please stop by our charter/tackle shop on Granville Island! As we move into February and March we will see the mature herring make their way into local waters to get ready to spawn. This means we will start to see some larger fish in the mix. So far this year, most of the legal fish have been under 12 pounds. This should change very soon as fish in the 15 to 25 pound range are often caught in the next couple months. We are running our "Winter Chinook Charter Special" until March 31st/2017. This is one of our best charter option of of the year! Have a look at this link, it gives you an idea of our winter rates and what winter fishing is all about! If you are looking for a quick, convenient winter fishing. Check out the link below. 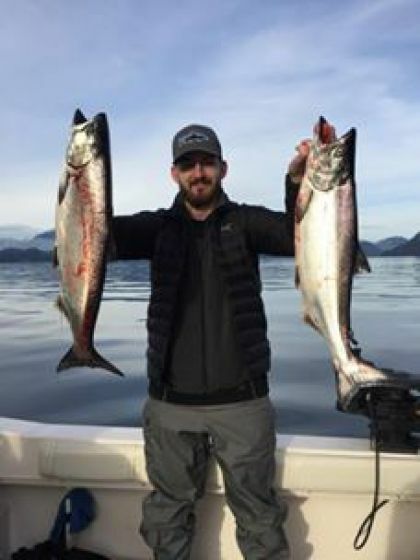 You can combine a couple days of winter fishing with amazing waterfront accommodation at the Union Steamship Resort on Bowen Island.